I call this “gifted” fur because Bowser willingly lets me brush him every day in the summer to remove his winter fur. I want to stress in an attempt not to put bears in danger — that this fur can only be given willingly from a live bear. A killed bear would only have a small handful of fur available. I can brush Bowser for 15 minutes or 4 hours, but only a small handful of fur is loose and available each day. It takes all summer to collect enough to take to our special spinner Nicole Terrell, who spins it together at the proper thickness and presents us with about 40 yards of yarn. That is all that’s available, and that’s another reason this gifted fur is so special to me. From this yarn, I have been creating bracelets, necklaces, and other braided gifts. These have not been for sale for profit, only as special gifts from Bowser and me. I will now be making special pieces for sale to support his new 1 acre enclosure with his own pond, boulders, and lots climbing trees, and a cave dug into his hillside (Macomb Mountain). 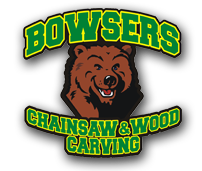 If you would like to contribute to developing Bowser’s improved habitat, you may write to me to order a spirit fur object. I have braided the spirit fur with leather or hemp (your choice). For jewelry, I’ve also added a small wooden end that latches through a looped end and a small adjuster bead for a snug fit. I’ve made other gifts with beaded feathers and other designs, and I will continue to make unique pieces and one-of-a- kinds. This gifted fur is a symbol of love/Bowser’s spirit into the world of form. I hope that these gifts will help make it possible to improve Bowser’s habitat, and we both thank you for your support.